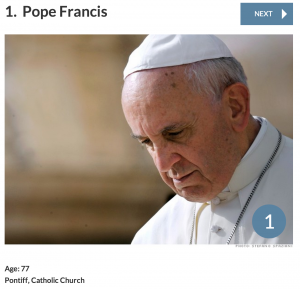 NEW YORK, March 20, 2014 (Zenit.org) – The global business magazine has named Pope Francis the world’s greatest leader in a world “starved for leadership,” it says. The list of 50 men and women “some famous, others little known” have been chosen for “energizing their followers and making the world better,” the magazine continues. Since his election, “Francis has electrified the Church and attracted legions of non-Catholic admirers by energetically setting a new direction,” the magazine says. It says that “signs of a “Francis effect” abound” and draws attention to a poll in March in which one in four Catholics said they’d increased their charitable giving to the poor this year it says. “Of those, 77% said it was due in part to the Pope,” it says. Others to make the list include German Chancellor Angelo Merkel, the businessman Warren Buffett, and the Burmese rights activist, Aung San Suu Kyi. In the year since his election, the Pope has been named Person of the Year by Time, and made the cover of Rolling Stone magazine, among others. Fortune is a global business magazine published by Time Inc. and founded in 1930. To read more, click here. To see them all, click here. Interesting, Obama did NOT make the list!